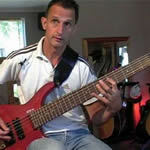 Learn advanced bass guitar with this Guitar Tuition DVD. The 4th in the Learn Bass Guitar series, this DVD looks at some advanced right hand techniques that will give your bass guitar playing more variety, increase your versatility and increase your style range. Well worth a watch if you want to learn some tips and tricks that will bring your bass guitar playing to the foreground of any song.